I appreciate Jonathan Hickman's honesty. When asked recently whether the new issue of Avengers would be a good jumping-on point for new readers, he answered “it’s a terrible jumping-on point” (not really the answer his editor wanted him to give). That's commitment to telling the story he wants to tell and assuming readers are smart enough to catch up or catch on. I say this because I can't imagine a new reader picking up East of West #9 and knowing what to do with it. We're very much mid-story and Hickman doesn't spoon-feed the reader. Issue 9 picks up in the Kingdom of New Orleans where we see the Crown Prince John Freeman and his lover/companion. They are both gorgeously rendered, and then we see what they see as they look out from their balcony - the Kingdom of New Orleans is an advanced, prosperous, beautiful place. We cut quickly to a far less attractive place, as we join our old friend Death, down in the depths with the Oracle. For several pages we don't see Death’s eyes, and that's for good reason. Let's just say that Nick Dragotta is in great form in this issue. He has a remarkable range as an artist, from scenes that are panoramic and gorgeous, to scenes that, well, I wouldn't recommend reading it right before you go eat lunch (Turns out, I have a negative reaction to eye-sockets with tentacles coming out of them. Who knew?). Dragotta and colorist Frank Martin (people don't talk enough about what he does) are in great form in this issue, such as in a scene where John Freeman is confronted by his own brother and the reaction is depicted with dynamic, kinetic action and explosive colors. You get a clear sense of John's skill and power from the art. I also love the touch of giving the flashback scenes different borders and slight sepia tones in some instances. Notwithstanding Death, the Oracle and her eye-socket tentacles (seriously, those give me the heebie-jeebies), the heart of this issue is The Crown Prince. We see his intelligence, his political savvy, his skill as a fighter, and the fact that he's playing a long game (a favorite character trait of Hickman protagonists, and Hickman stories for that matter). We've only seen him in short scenes at Armistice, so it's great to learn more about him and the world in which these characters live. He's a religious believer, but he's also a pragmatist and a planner. Hickman is engaging in some rich world building in this series, with multiple nations, complex motivations and tenuous alliances. Everyone has plans within plans, and it's a joy to watch the complex tension and beauty of it unfold. The focus of the series was initially on Death and the Apocalypse, but the scope has turned out to be something much bigger and more interesting. Rick Remender is having a moment. This week also saw the release of the newest issue of “Uncanny Avengers”, a series which has had its up and downs, but is it at the moment in the middle of an entertainingly huge, epic battle for the fate of the universe. Last week saw the very strong debut of “Deadly Class”, Remender’s tale of a secret school for teenage assassins set in the 1980s. Which brings us to Black Science. 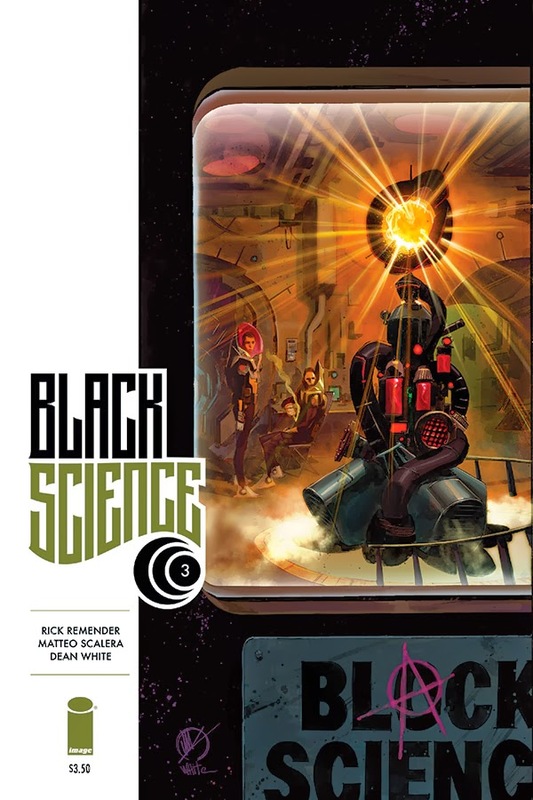 At the outset, if you're a fan of science fiction and you're not reading the series, go pick it up now. Seriously, I’ll wait. Go read it now. The story is sort of like “Sliders” or “Quantum Leap” meets “Lost in Space” meets “The Fantastic Four”, where the characters are traveling from one universe to another, encountering strange, alternate Earths. When we last left them, they had been transported to a world where technologically advanced Native Americans were defeating a far less technologically-advanced German speaking army in trench warfare. This issue alternates between that battle, and the hours leading up to when everyone is first sent hurtling across realities. There are moments of tension alternated with calm, and everything is coming to a head in this issue, both in the past and the present. It’s also remarkable to remember that for these characters, given everything they’ve experienced, only a few hours have passed. Each issue (including this one) opens with a striking splash page. Here we open with a detailed image of the city and a single line of dialogue. You'll want to just look at the image for a while (along with others in the book). Matteo Scalera’s work here is so beautifully, intricately detailed, and Dean White’s colors are so vivid and yet effectively convey a sense of grime and a “lived-in” feeling for the locations in the book. I will note that there are a few places where it’s not so easy to tell the characters apart (particularly the female characters), so that is slightly confusing (though it only happens in the “present” scenes where everyone is wearing identical protective suits). One other note. Kadir, the main antagonist within the group thus far, is portrayed as a villain in a fairly obvious way (in some scenes he looks like he should be twirling his mustache). He looks a little bit like the devil, to be honest. He does, however, get a nice, heroic moment in this issue which hopefully will be the beginning of showing that there's more to him than just being the “bad guy”. This series is off to a very strong start, and I feel like I’m starting to get more of a sense for the characters. In order to keep readers engaged, the book will need to show the reader both compelling, fantastical worlds (which they have already done) and compelling characters about which we should care (which they’re working on).